A team of biologists in the College of Art and Sciences is taking a long look at how climate change may shift the way the green grasses grow. 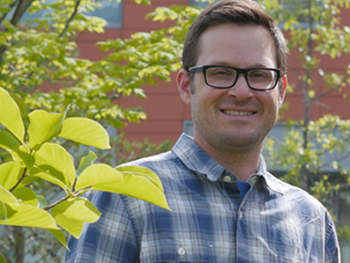 Jason Fridley, associate professor of biology and co-founder of the Climate Change Garden at the University, is part of an international research project that has been examining the effects of warming climate on plant life in Northern England for more than 20 years. Newly published in the cutting-edge journal Nature Climate Change, their research paper titled “Longer growing seasons shift grassland vegetation toward more productive species” (May 2016) offers insight into how various species of plant life may overtake others in a community because of changing global temperatures. 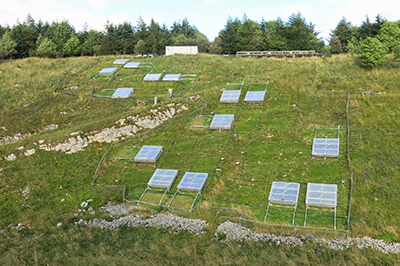 The team collected 24 species of plants from the Buxton Climate Change Impacts Laboratory (BCCIL) located in Derbyshire, England. The site is set up to experimentally manipulate different aspects of climate, e.g., temperature and precipitation, and track changes in vegetation and ecosystem properties. Those samples were then propagated and tested on site at the greenhouse facilities located within Syracuse University’s Life Sciences Complex by biology undergraduate Joshua Lynn ’13. The research paper is additionally co-authored by Lynn, site manager Andrew Askew and renowned plant ecologist Phil Grime, a professor emeritus at the University of Sheffield who was part of the initial team that founded BCCIL nearly 30 years ago. 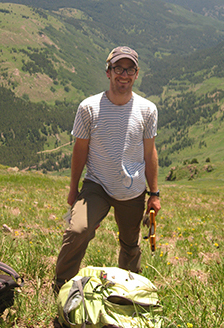 Lynn, who is now a Ph.D. candidate at the University of New Mexico, is continuing his ecological research in the southern Colorado Rockies. A standout at Syracuse from the start, he began his involvement in the project as a student working in Fridley’s lab. Although Lynn’s part in the study never brought him to the English site, he believes the exposure to this type of long-range research at Syracuse was invaluable to his academic and postgraduate goals. “My time at Syracuse was beyond expectation. I sought out research opportunities and the first major project I had the fortune to work on was this study. In the Fridley lab, I learned many of the concepts and tools that I still use today,” says Lynn. This summer, Fridley and his research team will conduct further investigations while continuing their longtime collaboration with UK research teams at Lancaster University and the University of Liverpool. The biologists hope to better understand how plant species adapt to warmer and drier conditions, and whether climate change has an effect on the plants’ genetic diversity.